Cold, wet and windy wintry conditions at Phillip Island made this year’s 6-Hour Relay a tough test of human endurance especially for all the volunteers and team members who spent their time exposed to the elements trackside. Drivers and vehicles didn’t fare that much better with more than the usual amount of carnage keeping the safety car and recovery crews busy. At the time of writing, your correspondent, who departed the circuit with a quarter of the event still to run, hasn’t seen the outright results nor the final placings of our two teams – Wild Dog and Wildhunde. Both teams had their share of troubles during the event and had slipped to bottom of the progressive placings during the day before fighting their way back up the listing. Glenn and Murray Campbell were sharing Glenn’s very quick AU Falcon ‘Saloon Car’ racer and despite the very dense track conditions (50 cars on the track) they both found it hard to keep under their nominated lap times. Harsh penalties are levied on the team if a driver goes faster than their nominated lap times and there is a set time of 1:55 seconds that nobody is supposed to break under – the big white ‘taxi’ was getting very close to that time. Locky Fowler had overheating troubles in his Datsun 240Z with coolant being blown out of the radiator and all over the engine if he pushed the revs over 5000rpm. Despite the problems Locky still managed to complete 22 laps in a series of short stints on the track. Robin Bailey’s Nissan 370Z didn’t seem to have any issues and completed a healthy 23 laps. Max Englellenner was meant to be competing in a Toyota MR2, but found that the regulations required open cars to be fitted with roll cages. 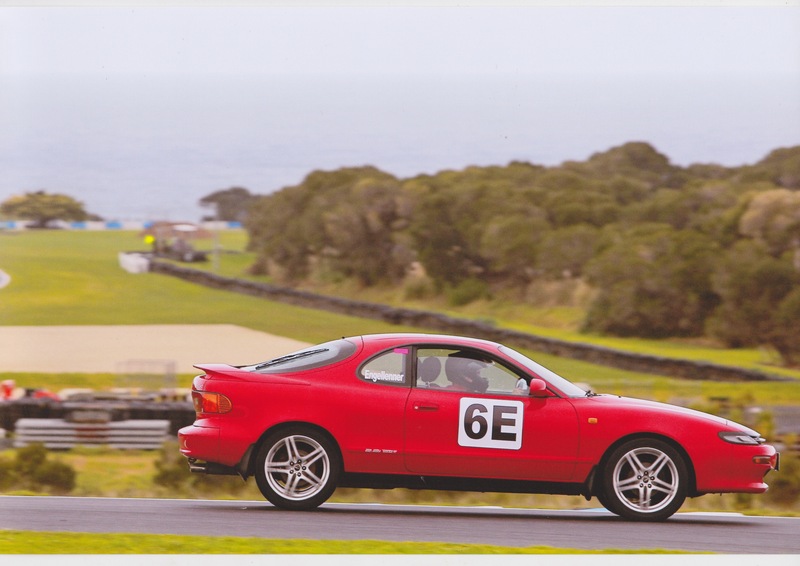 The simplest solution was to find a vehicle with a fixed roof, so Max purchased a stock standard Toyota Celica for $2000 off Gumtree and drove the wheels off it, completing 28 laps. Robert FitzGerald had his share of issues in Mort’s MGB Spa racer. What was initially thought to be a starter motor problem turned out to be simply a wire which had fallen off the solenoid. A new brake light switch was required to get the brake lights working and later in the day the engine was suffering from either lack of fuel or an electrical fault which caused it to break down under load at high speed. Never-the-less Robert still completed 13 laps – many of which were behind the Safety Car following an incident on the track which took in inordinate amount of time to clear up. Ron Brooks was happy with the way his WRX was performing this year, especially the brakes which had run out of pad material at last year’s event. Ron only completed 10 laps, but the car did at least double that after Ron invited Allan Richards to use it for a session following problems with the ‘Dad and Dave’ 120Y. Phil Finger and Paul Zsidy shared Phil’s Corolla hatchback and seemed to have a trouble-free run despite Phil having to compromise his driving position to cope with the limited reach of his left arm following last year’s elbow surgery. Phil completed 15 laps and Paul 19 laps. Mark Revitt-Mills seemed to be enjoying his 28 laps in the ‘Saloon Car’ Commodore racer. New sway bar bushes had transformed the handling and the car was as reliable as ever. David (and Allan) Richards had numerous problems with the little 120Y. Tail lights are required on cars for an event such as this and are used in wet conditions on the track. It was found at Scrutineering that none of the rear lights were working, so some frantic work ensued tracing a break in the loom. After practice on Saturday, a strong fuel smell indicated a leaking injector hose on the engine which was fairly easily fixed with a new clamp, but the biggest problem occurred on Sunday when the ECU decided to have some time-out. I believe the problem was overcome later in the day, but it cost Allan some track time in the car. With plenty of issues upsetting the carefully formulated strategy of both teams, Team Managers (Hayden Bailey, Glenn Campbell and Joel Martin) were kept busy during the event plugging gaps in the pit garages with anything that was still mobile. Thanks to all who helped out on the weekend or otherwise supported our teams’ efforts. Any contributions will be moderated before being posted here. The last 1.5 hours of the relay saw Glenn do lots of dry laps behind yet another Safety Car. This time it was because of a major accident between an MX5 and a Lotus on turn 12. Both drivers walked away, but the MX5 is no longer for this world. Max took over, and the rain started coming down. He was able to keep circulating in the trusty Celica. Murray was supposed to be last out, but ended up off the track at turn 4, bogged to the axle. A reluctant Max then had to go out again, and gallantly kept circulating in the increasingly heavy rain. I am not sure where the Team ended up on the scoreboard, but all involved enjoyed the challenge of the tenth running of the 6 hour. Also, a huge thanks to Haydn Bailey who did a sterling job as Manager for the weekend, and to the club members who assisted on the pit boards and timing. Sidenote: Of the several hundred drivers who have participated over the ten year history of this event, only 17 drivers have done all 10. Four of these are Gippsland Sporting and Classic Car Register members, Allan Richards, David Richards,Phil Finger and Glenn Campbell, who received 10th Anniversary badges in recognition. From Max Engellenner (Team Wildehunde 6E) Hi, I never got a chance at the 6 hour to thank my team, drivers, team manager and timers who did a sterling job under adverse conditions. So a big THANK YOU! My last drive in anger was in 1987 so you could say I was somewhat “rusty”. Here’s a little incident that happened in the last session that I unexpectedly drove. Having survived my 2 designated sessions I was in the toilets when I heard my name being called from the pit garage. Seems like the Falcon was beached and I was drafted in to drive the last session to bring the team home. 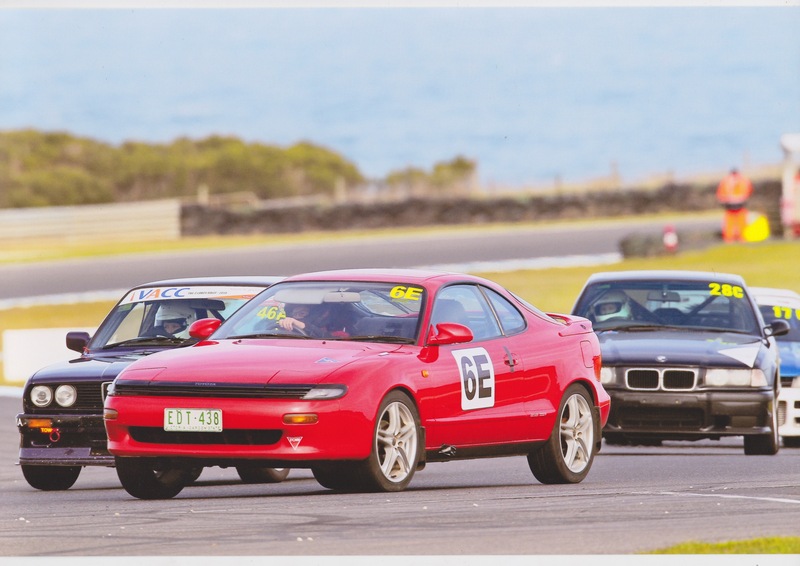 Normally this was no issue but as I drove the car to the circuit, and I was on my own, I was worried about getting the “Sillycar” home to Warragul amidst some carnage on the track. Nevertheless we decided to GO! Pit door was raised, I buckled up and a mad scramble onto the track ensued. I arrived at turn one and felt something was not quite right. As I tipped the tiller into turn two, I looked left and my HELMET WAS ON THE SEAT! Well there was no way I was going to drive any further so I pulled to the infield fully expecting to get bogged, thus letting the team down. We were under safety car, so I put the lid on and unbelievably got traction in the bog and rejoined the fray. I booted the old girl to catch up with the tail. The only problem was that the safety car had pulled off and I had the whole pack up my tailpipe again! The rain now was pretty torrential, my wipers were on mach 3 and barely coping, that’s when I passed the poor wet guy in the open Clubman and suddenly felt rather cosy in the coupe. I had no idea of how many laps there were to go, but I have so say I shouted a big YEAH when I passed the chequered flag. Once again thanks to all the Sporting Club guys who made it such a memorable weekend. Well done Max – you kept a car from our team out on the track in very trying situations and bad weather. You were the last car standing – must be a Japanese/German thing. Great to have you on the Team.